Chalk It Up held its 25th annual art festival on Labor Day weekend that gave artists the opportunity to create chalk-art on the sidewalks of downtown Sacramento. The organization is a non-profit that donates all of its proceeds toward local youth art programs. Each square cost $150 to rent, while those who wanted to watch were able to get in for free. ”Zea Marubashi, an art major who attends at Sacramento City College, spent the weekend working on her chalk portrait of a parrot. This was Zea’s eleventh year participating in the event. SCC alumnus Kelsey Escoler participated in her first ever Chalk It Up this year. 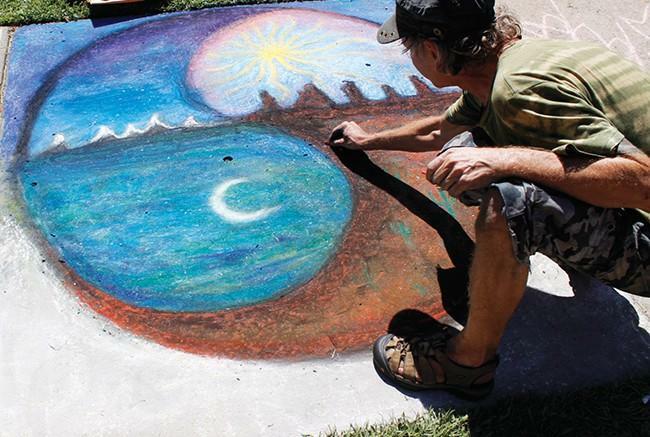 John Steesland, who graduated from American River College, also had his first Chalk It Up experience. Steesland’s favorite medium is white charcoal on black paper but he enjoyed working on cement. Folsom Lake City College student Julia Flippo was awarded second place for her close up portrait of a young girl in The People’s Choice, an award that all chalk drawers who rent out a space are candidates for. There were also live performances by local artists including the band “The Off Years” with one member, Brodie Mills, an ARC alumnus who plays guitar and sings backup vocals. 2 Comments on "Chalk It Up draws large crowd"
John Steenslands art was terrible. Juvenile at best.